The American Bankruptcy Institute Commission to Study the Reform of Chapter 11 of the U.S. Bankruptcy Code: Report and Recommendations recommends more than 200 discrete Chapter 11 policy reforms. 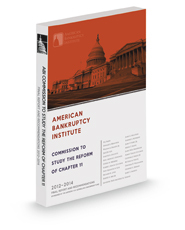 The American Bankruptcy Institute's Commission to Study the Reform of Chapter 11 was established in 2012 with a mission to study and propose reforms to Chapter 11 of the Bankruptcy Code and related statutory provisions. Its purpose was to find ways to better balance the goals of rehabilitating companies, preserve jobs, and provide value to creditors by facilitating more effective resolutions to companies' financial distress. The Commissioners are 22 of the nation's most prominent restructuring professionals, representing diverse stakeholders and interests. The Commissioners were supported by the official reporter, one the nation's top bankruptcy scholars. More than 130 other leading professionals from the fields of law, finance, judiciary, and academia served on 13 topical advisory committees, providing essential expert guidance to the commissioners. The commission's record included testimony at some 17 public field hearings held around the country, hundreds of written submissions, scholarly articles, empirical data, and opinion surveys. After months of deliberations, the Commission unanimously adopted this report to provide to Congress.